The Most Wonderful Time of the Year, after Christmas: the iconic Manchester Christmas Markets. Image by Andrew Stawarz (Creative Commons License: Some Rights Reserved-No Derivatives). On the 10 November, Manchester’s popular Christmas Markets will be back, and the team at Net Sixty Six SEO cannot wait! For many people, it is the curtain raiser to many a Christmas celebration. At this very moment, the market’s distinctive wooden stalls are being assembled on Brazenose Street. Our city centre’s Christmas market has seen a rapid growth in stalls in the last eighteen years. Since its introduction in 1998, its appeal has gone beyond Manchester City Council boundaries. It is now a world famous event; so much so that Northern Rail hired extra loco-hauled trains for the opening weekend of the 2014 event. Since 1998, the market has been centred around Albert Square (close to Net Sixty Six SEO’s present HQ). Extra stalls were added to St. Ann’s Square and New Cathedral Street. Last year’s event (and this year’s as well), sees the event stretching from the Corn Exchange, all the way down to Albert Square via St. Ann’s Square and King Street. There will also be a line of stalls along the pedestrianised section of Market Street. With Manchester being the most visited city in England, outside of London (and the third in Britain behind Edinburgh), it is no surprise as to why the Christmas Markets have a nationwide pulling power. You cannot beat the joys of a lively Manchester city centre. As epitomised by the Heroes Parade and Christmas Lights switch-on events, this is a city defined by the phrase “work hard, play hard”. When Manchester gets her hair down, it does so with cheery aplomb. 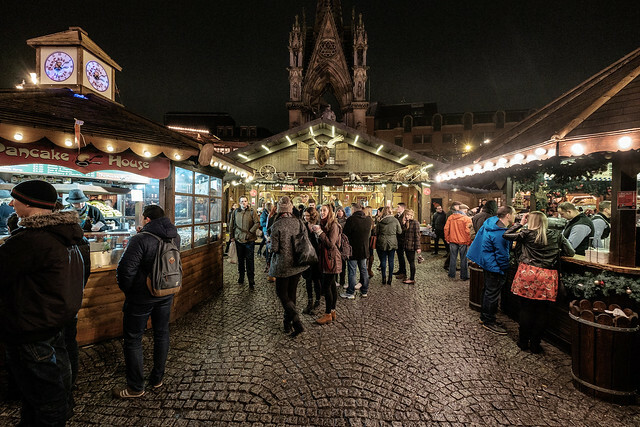 For us, the highlight of the Christmas Markets are the variety of food and drink stalls. Besides being an alternative to the usual haunts, we adore the German sausages, continental lagers, and paella. Plus the Stollen and Belgian waffles, the Gluhwein, and other traditional European fare. What else do we like about them? The chance to buy unique gifts, clothing, artwork, and toys. They offer a nice break from the usual stuff in city centre Manchester. Better still is the fact all this is taking place on our doorstep! From our previous place, it was a fair walk. The Manchester Christmas Markets will run from the 10 December to the 20 December. Stalls on Albert Square will be open from 10 am to 9 pm, seven days a week (apart from the 21 November, when stalls will close at 6 pm). All other stalls are open till 7.30 pm in November, and 8 pm throughout December. For more details, visit the Manchester City Council website.